The death toll in the serial bomb blasts that rocked the western Indian city of Ahmedabad on Saturday has risen to 49, police say. Meanwhile, Prime Minister Manmohan Singh has visited the city to assess the situation and talk to the injured. 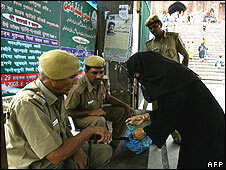 Indian cities are on high alert as police hunt for those responsible for the blasts which wounded over 100. Ahmedabad was the scene of violence between Hindus and Muslims in early 2002 which left hundreds dead. Accompanied by Congress Party leader Sonia Gandhi and the federal interior minister Shivraj Patil, Mr Singh visited some of the blast sites and also went to the hospital to see the injured. The leaders were surrounded by layers of security, including army commandos. At the Civil Hospital, they were joined by Gujarat Chief Minister Narendra Modi. 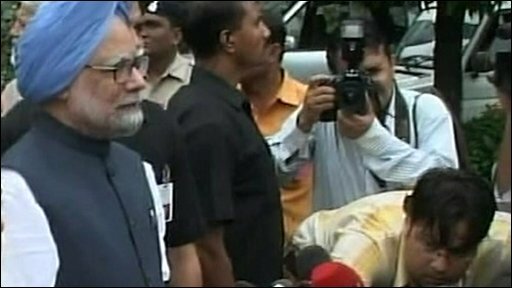 Later, talking to reporters, the prime minister said he had come to express "solidarity with the people of Gujarat in their hour of crisis". "I commend the people of Gujarat for the resilience they have shown. These terrorist acts are aimed at destroying our social fabric, undermining communal harmony and demoralising our people," Mr Singh said. "We will rise to the challenge and these forces will not succeed," he said. Meanwhile, police say they have arrested one man and detained several people for questioning. On Saturday, 17 blasts struck residential areas, market places, public transport and hospitals within an hour. A number of unexploded bombs have since been found. It is thought the explosions were caused by crudely-made devices containing ball-bearings and other shrapnel, hidden in boxes and on bicycles. Local media reports say a little-known Islamist group, the Indian Mujahideen, has claimed responsibility in an e-mail to a television channel. Police have carried out a raid on a house near India's financial capital Mumbai (Bombay), where they believe the e-mail originated from. A similar e-mail was sent to news channels by the Indian Mujahideen group after blasts in the western city of Jaipur in May which killed more than 60 people. The attack in Ahmedabad - Gujarat state's commercial capital - came a day after several devices went off in the southern city of Bangalore. The government has deployed an extra 3,000 security personnel in Delhi, and other cities, including Mumbai and Jaipur, are on alert. The bombs in Ahmedabad were detonated with timers in two phases, the first at about 1830 (1300 GMT), officials said. The second series of explosions caught some victims and their helpers arriving at hospitals. At least two unexploded bombs were later defused in Ahmedabad and sent for forensic examination. Another two unexploded bombs were also found in the nearby city of Surat. India's leaders have appealed for calm. President Pratibha Patil urged people to remain "steadfast in this testing time and maintain peace and harmony". Prime Minister Manmohan Singh also condemned the attacks, and urged people to remain calm and maintain communal harmony. Narendra Modi, the controversial chief minister of Gujarat, said the "land of Mahatma Gandhi has been bloodied by terrorists whom we shall not spare". "Terrorists are waging a war against India. We should be prepared for a long battle against terrorism," he warned. Mr Modi has been accused of failing to protect Muslims in the riots in Gujarat during 2002 in which at least 1,000 people - most of them Muslims - died, including many in Ahmedabad. The violence erupted when a fire broke out on a train carrying Hindu pilgrims, killing at least 59 people.